Wyoming salesman Derrell Alexander's mantra: "Stay with them until they buy or die." 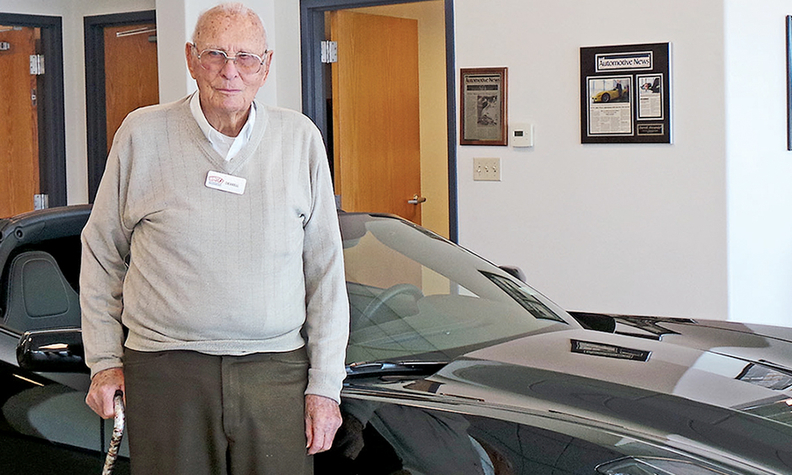 Derrell Alexander has lived a century, and for most of that time, he's been on the showroom floor. The Wyoming car salesman celebrated his 100th birthday on March 17. Despite his age, "like clockwork," he reports for work at White's Mountain Motors in Casper at 8 a.m. sharp and leaves at 3 p.m. Monday through Saturday, new-car manager Marco Castillo said. The Chevy salesman has outlived much of his loyal customer base, but now that group has expanded to include the children and grandchildren of his regulars. "Sixty-year-old ladies remember him selling their parents cars," Castillo said. "Rarely will there be somebody [who] he doesn't remember what car they had or something about them." Alexander said: "I meet a lot of interesting people from all walks of life." White's Mountain Motors has changed ownership four times in the nearly 53 years he has worked there. But Alexander began in the car business 16 years earlier. From 1946 until he joined the Casper dealership in 1962, he sold cars from a Chevrolet store in Douglas, Wyo., about 50 miles away. His colleagues say Alexander knows how to connect with customers. "The guy's definitely persistent," said General Manager Brad Follensbee. His sales pace has slowed in the past few years; Castillo estimates that Alexander sells six to 10 cars per year these days. The peak of his success was throughout the 1950s and 1960s, when he would close 30 deals per month. His selling tactic, Alexander said: "Stay with them until they buy or die."